Pookchurch Vineyard has been created by David Wood. It brings together his long held interest in the countryside with a desire to produce something with his own hands, and of course, a love of wine! So in 2016, after spending 25 years running conferences and exhibitions, David embarked on the challenge of creating a new commercial vineyard and becoming a successful grower of grapes for local winemakers. Though new to viticulture, David's very aware that how we go about this really matters. There's something compelling and rewarding about the growing of grapes, not just because of the part it plays in the art of winemaking, but also as an endeavour in itself. It's a centuries old practice, long associated with human passion and commitment, and with an essential connection between vines, land and environment. That's part of what drew David to Pookchurch, and what will help guide the way in which we manage the vineyard. Pookchurch is in a very special setting. It has been planted on a site of about 100 acres, close to the village of Cuckfield in Sussex, in a designated Area of Outstanding Natural Beauty. The land slopes gently south, with views to the South Downs and seems ideal for growing vines and producing grapes. It really does feel like a privilege to be working in such a beautiful landscape, and we intend to respect it and look after it. Before the vines were planted, the land was used to grow wheat and broad beans. Already the geometry of the vine rows adds a different look, and as the vines mature, they will add something pleasing to the landscape, as other local vineyards have done. David's been fortunate in assembling a team of excellent people who have brought their skills and knowledge to the project - and without whom the progress we've made so far wouldn't have been possible. In the coming months we want to add more expertise in the form of the vineyard management team, who will manage the vineyard through its second year and beyond. The creation of Pookchurch Vineyard has been, and continues to be, the work of many. 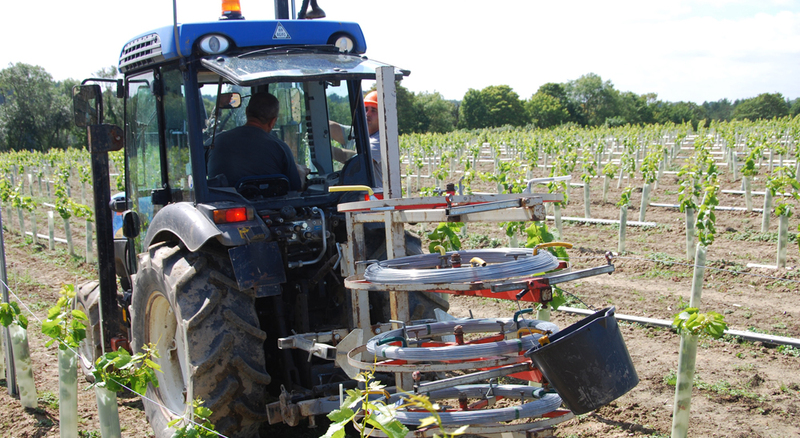 The vineyard design, planting process, and management of the vines during the summer has been undertaken by Darcy, James, Chris and Joel at Vine Works Ltd, who have also embarked on the considerable job of erecting the trellising system. Land preparation, and site management has been overseen by Matthew and Mandy at Complete Land Management (CLM) who continue to provide invaluable support to the project. Stephen Skelton has been on hand to provide a useful sanity check. Over 4 kilometres of Deer fencing and gates took some time and effort to complete, and much of it was put up by Tim Bennett Fencing. The drainage system for the lower fields amounted to 16 kilometres of trenching and pipes, and was installed by Graham from G&S Browns and designed by John Vince at Drainage and Groundwork. Back in the winter, sympathetic tree trimming and thinning was performed by tree surgeon Kevin Rodgers and bridleway and access surfacing was done by R&B Construction, who are soon to start work on construction of the general purpose building. Planning and Landscape advice throughout the year has been provided by Dale from Dowsett Mayhew and Andrew at Ramsay & Co. The Pookchurch brand and this website have been designed by BD Creative, and Sam Moore at Visual Air and Phil Hardman have contributed many photos and images. Many thanks to everyone involved for their help in bringing Pookchurch to life!